Being a lover of good food, I find it almost impossible to answer the question ‘what’s your favorite dish?’ But if I had to, my answer would probably be Eggplant Parmesan—parmigiana di melanzane in Italian—the way Angelina used to make it. This is a simple dish to make, but it involves several steps. Allow yourself a good two hours to prepare this dish. It tastes much better made ahead, so if you have the time, make it in the morning and have it for dinner or, even better, make it at your leisure the day before. Step 1: Prepare the eggplant. You begin with eggplant, of course. For this dish, the large, purple variety is preferable. You cut the eggplants into fairly thin slices. Now you should ‘purge’ them of their excess liquid, which can be bitter. Sprinkle the eggplant slices with salt, and then lay them in a colander laid on top of a plate. Cover the slices with a small plate on which you should place something a bit heavy like a can of beans or tomatoes. This will help press the liquid out of the eggplant. Leave them for about an hour. You should notice a small puddle of brownish water below the colander, which you should discard, of course. Remove the slices from the colander and pat them dry. Step 2: Fry the eggplant. Now you dip the eggplant slices in flour, followed by an egg and cheese ‘bath’ made from beaten eggs, grated pecorino cheese, finely chopped parsley, salt and pepper. Shallow fry the eggplant slices over moderate heat until they are golden brown on the outside and tender inside. You will need to fry the eggplant slices in batches. As each batch is done, drain and set on paper towels to absorb the excess oil as you continue with the next batch. Repeat until you’re done. Step 3: Prepare the tomato sauce. While this is going on, prepare a very light tomato sauce by combining chopped tomatoes (fresh if in season, but canned tomatoes are fine), a few leaves of fresh basil, salt, chopped garlic and just a few drops of olive oil. (Some people omit the olive oil altogether since the eggplant, even after draining, can be a bit oily.) Simmer for about 15 minutes, until the tomatoes have melted into a sauce If using canned tomatoes, add a bit of water to loosen the sauce before simmering. You will want a good amount of sauce, so be sure to make a potful–you can always any extra to dress pasta. Step 4: Prepare the cheeses. Take a large mozzarella, preferably fresh, and slice it. Grate lots of parmesan cheese, at least a cupful (you can grate it as you assemble the dish). Step 5: Assemble the dish. Bake in a hot oven (400 F, 200 C) for about 30 minutes, or until the dish is bubbling hot and the top a bit brown. Don’t worry if it even looks a bit ‘burnt’ around the edges–that’s normal and, to some tastes, the best part! Let the dish cool a bit before eating, at least 15 minutes. In fact, it tastes best made ahead and reheated (just a bit) before eating. It can also be eaten at room temperature. Just don’t eat it piping hot, because you will miss the full, wonderful flavors! A friend from Naples once told me that this version of Eggplant Parmesan—made with eggplant slices dipped in egg—is typical of the interior of Campania, the region where Naples is located and of which it is the capital. In fact, that’s where Angelina was from, a small mountain town near Benevento. In Naples proper, this dish is made with eggplant slices that are simply lightly floured and fried. Most modern recipes you will find follow the Neapolitan method. I’ve tried it that way and it makes for a lighter dish. But I still like Angelina’s version best! For an even lighter dish, you can brush the eggplants with olive oil and grill or oven roast them instead of frying. The result is actually very nice, but you are getting pretty far from the original flavor and texture of the classic dish. What is not original or authentic is the version you often find here in the US, where the eggplant is breaded. Personally I find it a travesty. If you try the dish this way, you’ll see it produces a far superior result. They also make this dish in Sicily (in fact, the Sicilians claim the dish is theirs-see below) but without the mozzarella cheese. If you are pressed for time, you can skip the initial ‘purging’ of the eggplants. As long as the eggplants are reasonably fresh, it should not make that much difference. I sometimes skip this step myself. But be aware, there is a chance that the dish will have a bitter aftertaste. And if you want an even quicker dish, instead of a tomato sauce, you can use passata di pomodoro or crushed canned tomatoes–it will cook in the oven–a drizzle un filo d’olio over each layer. 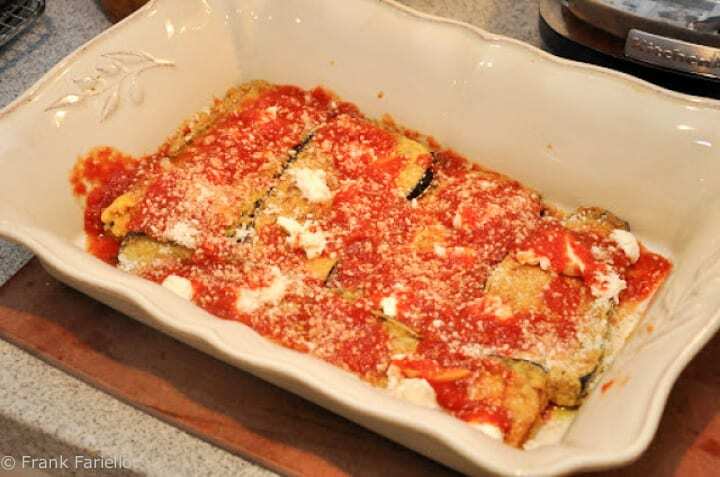 Some recipes for Eggplant Parmesan call for baking the dish in a moderately slow oven and for a longer period, from 45 minutes up to an hour, raising the temperature at the very end if necessary to brown the top. The advantage of this method is that you are less likely to burn the top. This dish can play many roles in an Italian meal. It can serve as an antipasto, as part of a buffet, as a light secondo or as a piatto unico: a single-dish meal in itself. And, to be honest, I even eat it, the morning after I make it, for breakfast! By the way, as is typical for a popular dish with many variations, there are a good number of different stories about the origins of this dish. some of them place it in or around Naples, while say the dish originated in Sicily. Despite the name, however, it is very doubtful that this dish comes from Parma. The name may refer simply to the generous use of parmgiano cheese in the dish. Some early sources say that the parmigiani were known for making layered vegetable casseroles. 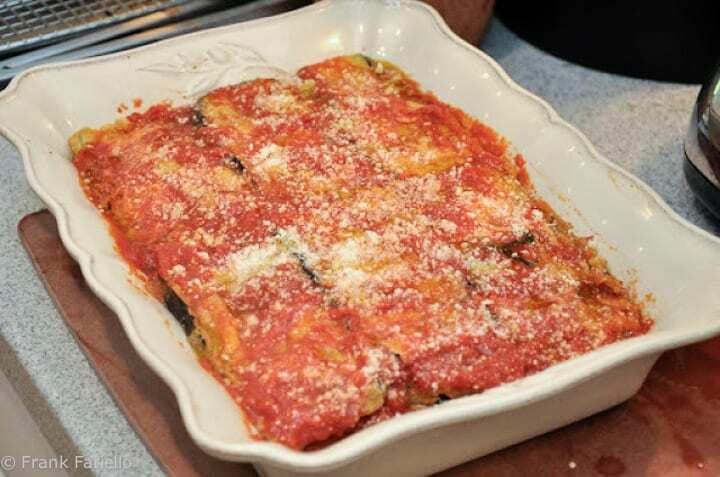 The Sicilians say that the name comes from parmiciana, which the dialect word the slots in window shutters (persiane in proper Italian) since the eggplant slices lined up in the baking dish were said to resemble said shutters. This interesting article discusses the various claims and their relative merits. If you can read Italian, Wikipedia also has an article on the dish. Both place the probable origin of Eggplant Parmesan to Campania and to the 18th century chef and writer Vincenzo Corrado. Prepare the eggplant. Cut the eggplants into fairly thin slices. Now you should 'purge' them of their excess liquid, which can be bitter. Sprinkle the eggplant slices with salt, and then lay them in a colander laid on top of a plate. 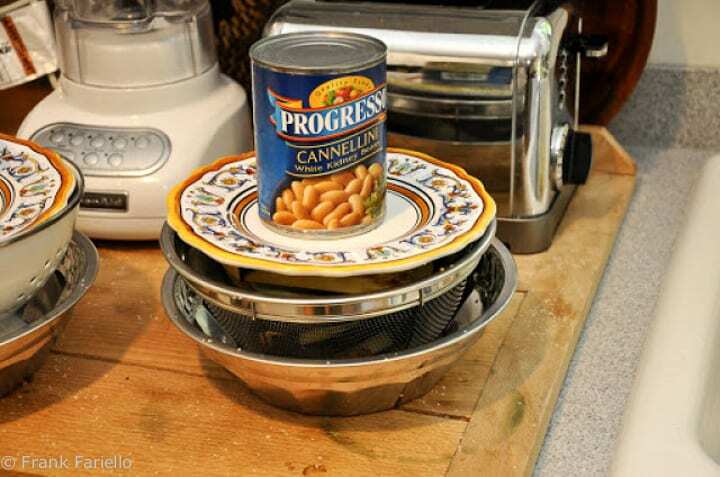 Cover the slices with a small plate on which you should place something a bit heavy like a can of beans or tomatoes. This will help press the liquid out of the eggplant. Leave them for about an hour. You should notice a small puddle of brownish water below the colander, which you should discard, of course. Remove the slices from the colander and pat them dry. Fry the eggplant. Dip the eggplant slices in flour, followed by an egg and cheese 'bath' made from beaten eggs, grated pecorino cheese, finely chopped parsley, salt and pepper. 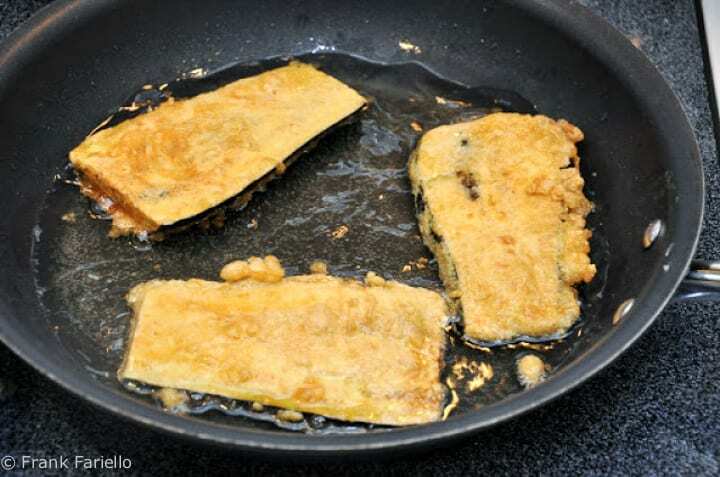 Shallow fry the eggplant slices over moderate heat until they are golden brown on the outside and tender inside. You will need to fry the eggplant slices in batches. As each batch is done, drain and set on paper towels to absorb the excess oil as you continue with the next batch. Repeat until you're done. Prepare the tomato sauce. In the meanwhile, prepare a very light tomato sauce by combining chopped tomatoes (fresh if in season, but canned tomatoes are fine), a few leaves of fresh basil, salt, chopped garlic and just a few drops of olive oil. Simmer for about 15 minutes, until the tomatoes have melted into a sauce If using canned tomatoes, add a bit of water to loosen the sauce before simmering. Prepare the cheeses. Take a large mozzarella, preferably fresh, and slice it. Grate lots of parmesan cheese, at least a cupful (you can grate it as you assemble the dish). Baking. Bake in a hot oven (400 F, 200 C) for about 30 minutes, or until the dish is bubbling hot and the top a bit brown. Let the dish cool a bit before eating, at least 15 minutes. In fact, it tastes best made ahead and reheated (just a bit) before eating. It can also be eaten at room temperature. Frank, I made your recipe for eggplant Parmesan once again yesterday and I realize that I had not yet left a comment and praise for this fine recipe. Truth is, I was never a big fan of eggplant parm. It was always covered in bread crumbs and it always seemed rather blah, whether I made it or ordered it when out. A couple years back, shortly after I found your blog, I tried making it again — your way — floured and dipped in the egg, cheese, parsley. Coming from a guy who could take or leave eggplant parm I must say that your eggplant parm recipe has converted me to loving eggplant parm! It is like an entirely different dish once you get rid of those bread crumbs. Of course now I no longer can order it when I am out since I am spoiled by the RIGHT way to cook it! Now I make a batch every few weeks. Since I usually am only cooking for two, I usually cut the recipe back to using only one big eggplant. Thanks for the terrific recipe Frank! And thanks so much for your kind comment, Jim! I’m really glad you came around about eggplant Parmesan. Made this way, it’s one of my favorite dishes. And I totally agree the (unauthentic) version with breadcrumbs just doesn’t cut it at all. So, is it 2 eggplants or 3-4? Depends on how many you’re serving. 2 eggplants are fine for 3 or 4 people. Love the battered aubergine! Thank you Frank, I’m always going to make it this way from now on. Well worth the effort! My mother — & apparently her mother — served this but didn’t fry it first. She baked it longer, & perhaps at a lower temperature. I’ll have to ask her. maybe that’s the Sicilian method??? Not sure, but I believe the Sicilians also fry their eggplant first. I love this recipe and I make it quite often. However, I grew up in similar surroundings (Italian grandma, etc) and she always fried the eggplant with breadcrumbs. Is that wrong? Well, I wouldn’t say it was wrong, but it’s the Americanized way of making the dish. What town near Benevento is Angelina from? I’m from Civitella Licinio, about 5 miles from Benevento. The town is called Apice. Do you know it? According to Google Maps, it’s only about 50 kms away… Small world. I am wondering if you are going to put the “Frank could not have been more correct” in the “what our readers are saying” section! LOL Clearly the “I still think my meatballs are better” is not! On a lighter side, I just dip the eggplant in flour and fry lightly in olive oil omitting the egg but will definitely add the pecorino, parsley etc to the flour…being from Campania region my mom makes it exactly like you…mille grazie!! This has to be one of the all time great dishes and as luck would have it I have melanzane in the fridge so guess what I am going to do? I have it in the oven right now! Fantastic, Tom! Hope it turned out well. I made this today, let it cool down and now I tasted it …. died and gone to heaven! Thank you so much for this and all the other recipes! Your explanations are so helpful and easy to follow. I am not concerned about the fat content, evoo (extra virgin olive oil) is very healthy 🙂 and I am not eating the whole dish in one go. @Stelio: Many thanks for your kind comment! Greek cuisine is one that I've always wanted to explore. So similar, it seems, in many ways to Italian cooking but yet different. I am familiar with versions of moussaka, which I have enjoyed, but surely nothing to compare with your homemade version! Frank this is one heck of a recipe, and very well written and explained. In Greece we have a dish called Moussaka which requires fried eggplant. To make the dish lighter I brush the eggplant slices with oil and roast in the oven till tender as you say. It does tend to make the whole dish less oily. Unfortunately everybody is now thinking of “Heathy Eating”. But I agree if it is not made the way it should be made then it should not be made at all!! Bravo again. Hope your move is finished and you are comfy in your new place. This is a recipe that I will try for sure. Grazie!!! What a great recipe. I've never pressed my eggplant first. I'm going to give that a spin next time. i made this on sunday…BEST. EGGPLANT. PARMIGIANA. EVER. thank you. i've been following your blog for a little less than a year now and have made many things (mostly the casserole dishes) and they are all spectacular. i think i was italian in another life. anyway, love your recipes and the way they are written. I used to hate eggplant. But studying in Rome has made me realize how eggplant can be a good food! Love it eversince! Hi Frank and Sous-Chef Twain ( that's what I call my dog too 🙂 I have to agree Eggplant Parmigiana is a fantastic dish! I've only tried it at restaurants but honestly I can't wait to try your recipe. I'm printing it out to try it hopefully this week, how exciting. Thank you for sharing your authentic recipe. Thanks, all, for your kinds comments–on behalf of myself and my sous chef, Twain! Wonderful commentary, and your detailed instruction is greatly appreciated–bookmarked for the fall! Oh my God Frank! This looks soooo amazing! Right off my Nonas' table! wow! looks so delicious! I like the idea of pressing out the juice, I have never tried it that way–thank you for the tip. Hands up and my hat´s off or you sir. Great recipe. Great times. Oh goodness, that is one luscious slice of eggplant parmesan. I would love to sit down for a meal at your table someday. My great-grandmother was of Sicilian heritage and made it how you said, like this but no mozzarella, can't wait to make this, fresh mozzarella with this dish sounds divine! So amazing and authentic! Eggplant parm is one of my favorites too. And your Sous Chef is a cutie! MMMMM, Eggplant Parm, great recipe, thanks for sharing, and I am loving your Sous Chef, ADORABLE!!!! Fantastico piatto siciliano: provare per credere!! Mmmmm….next time I will try Angelina's method, with the egg. Your Parmigiana di melanzane looks fabulous!! Thanks for the recipe and for all of the interesting information about it. OMG I LOVE EGGPLANT AND THIS RECIPE SOUND FANTASTIC!! !